A chord named after the first chord in Richard Wagner's Tristan und Isolde. 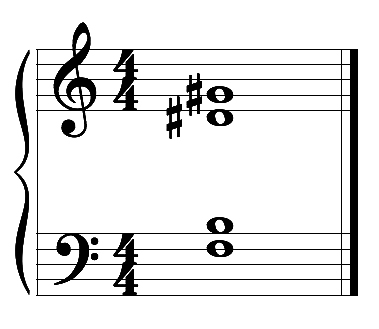 The original Tristan chord consists of F, B, D sharp, and G sharp, but the name applies to any chord with the same intervals. The interval from F to B is an augmented fourth, F to D sharp is an augmented sixth, and F to G sharp is an augmented ninth. This chord is also called a half-diminished seventh chord.